Uncle Maddio’s Pizza Joint announced the launch of its fall specialty menu items fusing popular American favorites, pizza and cheeseburgers. Uncle Maddio’s lives up to its reputation as the fastest-growing fast casual pizza franchise with four openings in the next four weeks, including inaugural locations in Florida and Tennessee. Atlanta, GA (April 30, 2013)— The fastest-growing fast casual pizza franchise, Uncle Maddio’s Pizza Joint, is pleased to announce the opening of four new locations next month. The pizza franchise will open its first restaurant in both Florida (Tallahassee) and Tennessee (Knoxville), along with two new Georgia locations in Savannah and Tucker. This brings the total open Uncle Maddio’s restaurant locations to 15, with 125 more in development. “I was first drawn to Uncle Maddio's by the build-your-own pizza concept,” says Tallahassee Uncle Maddio’s franchise owner Michael Holmes, “but I have fallen in love with the culture. Their branded ‘Served with Love’ brings a warm, energetic feeling to our guests and our restaurants – it’s unlike anything I have ever experienced before in the food service industry.” The Tallahassee Uncle Maddio’s Pizza Joint will be located in the new Mahan Village shopping center. Coined the “Chipotle of pizza,” Uncle Maddio’s launched the fast casual pizza market four years ago with the opening of its first store in Atlanta, Georgia. Uncle Maddio’s feeds into diners’ growing demand for more choices when eating out, including fresh, organic ingredients, as well as the need for gluten-free and allergy-friendly options. The innovative Uncle Maddio’s menu gives diners more than 3 million pizza combinations, in addition to freshly made salads and toasted paninis. In the next few months, Uncle Maddio’s will have 20 restaurant franchises open. There are currently 125 more in development throughout the Southeast. For pizza franchising information, contact Roger Wagerman at roger@unclemaddios.com or visit www.unclemaddios.com/franchise-info. Uncle Maddio’s was created by the founding member and former president of Moe’s Southwest Grill. Our executive management team has over 50 years experience in the restaurant industry. Uncle Maddio’s is the fastest-growing fast casual pizza restaurant in the Southeast. By the end of summer 2013, there will be 20 Uncle Maddio’s restaurants open and 125 more in development throughout the Southeast. To own an Uncle Maddio’s franchise business in your neighborhood, email Roger Wagerman at roger(at)unclemaddios(dot)com or visit http://www.unclemaddios.com. University of South Carolina location in Columbia now open! Grand opening party on Saturday, April 6, will feature free pizza for a year to the first 100 customers and live music. Atlanta, GA (April 3, 2013)— Uncle Maddio’s Pizza Joint this week announces the grand opening of their newest and first restaurant in South Carolina near the University of South Carolina campus in Columbia. The grand opening party will be held on Saturday, April 6 from 11:00 a.m. to 10:00 p.m., featuring free pizza for a year for the first 100 customers and live music. Uncle Maddio’s answers the call for more choices and better food with an innovative menu that gives customers more than 3 million pizza combinations. Their menu contains three types of crusts (white, wheat, and gluten-free), six sauces, seven cheeses (including Daiya vegan cheese), and 47 different fresh toppings, including locally-sourced vegetables delivered fresh daily, hormone-free chicken, organic greens, and handmade meatballs and sausages. In addition to pizza, they serve toasted paninis and gourmet salads. The new Uncle Maddio’s is located at 601 Main Street, Suite A near the USC campus. They will join neighbors Moe’s Southwest Grill, Domino’s, Firehouse Subs, and Al Amir. The restaurant opening will provide new jobs for the area, as well as new and exciting family-friendly dining, take-out, Take & Bake, catering, and event options for the campus and local community. For more grand opening information and to grab a free 9” pizza coupon, visit the Uncle Maddio’s USC Facebook page athttps://www.facebook.com/UncleMaddiosUSC. Known as the “Chipotle of pizza,” Uncle Maddio’s launched the fast casual pizza market four years ago with the opening of its first store in Atlanta, Georgia. By the summer, there will be 20 restaurant franchises open and 125 more in development throughout the Southeast. With their innovative menu, unprecedented match-up of franchising experience, and distinct branding, Uncle Maddio’s leads the way in fast casual pizza restaurants. For pizza franchising information, contact Roger Wagerman at roger@unclemaddios.com or visit www.unclemaddios.com. Uncle Maddio's Pizza will donate 15% of their sales to Cambridge Baseball! Uncle Maddios Pizza Joint is hosting yet another spirit night for baseball next Wednesday, March 13th from 5-7. The owner, Jonathon Schrader, has been very gracious to partner with CHS Baseball to use his restaurant as a means of fundraising for the program. 15% of ALL proceeds (everything sold during this time, not just food/drink sold to baseball families) will go to the Bears Baseball program! Even if you aren't available to make the event yourself, tell your neighbors, friends & co-workers to show up on Wed, 3/13 from 5 to 7 pm and the Baseball team will reap the benefits. Tell Uncle Maddio's you're from Cambridge High School! In celebration of National Chili Day today, Feb. 28, Uncle Maddio's Pizza Joint will give away free samples of its chili throughout the day. Uncle Maddio's chili is created based on the company's founder Matt Andrew's grandfather's 80-year-old recipe. As chili parlors became popular in the 1930s and '40s, Frank "Scully" Andrew opened a small chain of "Scully's Chilli Parlors," located in Springfield, Ill. Christine R. Toney's book, The Magic of the Chilli, the Midwest Chilli History Cookbook, mentions "Scully's Chilli Parlor" as one of the few early pioneers. "True to my grandfather Scully's recipe," Andrew said, "the Uncle Maddio's 'Scully's Chilli' tastes like your favorite, down-home bowl of chili. We use the same fresh ingredients as we do in all of our menu items and we make it in our restaurants daily. Pizza is our specialty, and that will never change. But chili is in the family." Now Open: Buckhead Opens with a Bang! Over the weekend, our newest Uncle Maddio's Pizza Joint opened in the Buckhead neighborhood of Atlanta, GA -- and what an opening it was! There were 120 hungry customers in line when the doors opened. Each and every person in line received our signature free-pizza-for-a-year vouchers (that's 52 mouth-watering pizzas from Uncle Maddio's). Diners enjoyed not only the awesome taste of Uncle Maddio's food -- some for their very first time (we call them Maddio's Newbios) -- but face painting and an entertaining stilt walker. Earlier in the week while Uncle Maddio's staff was training and prepping to open, the restaurant offered up free food served with love to around 70 people each from Sober Living America and No Longer Bound. To read more about our Buckhead restaurant opening from unbiased sources (yes, we're biased -- what can I say? ), check out the blog-love at Boy Mom Blog, The Bizy Mommy, and Mommy Talk Show. You probably already knew that Uncle Maddio's caters, but did you know that we do block parties? Oh yeah, that's right -- fresh, hot Uncle Maddio's pie for your whole neighborhood! 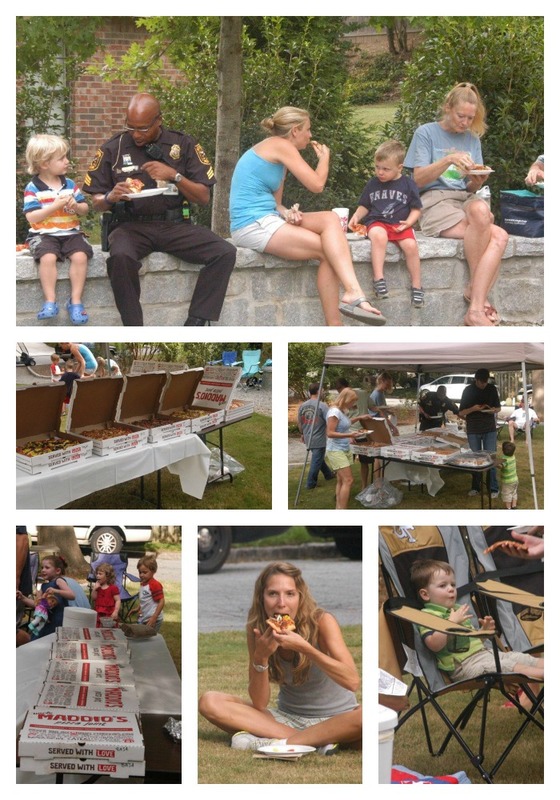 On Tuesday, August 7, we sponsored the 27th Annual National Night Out (NNO) for the Brookhaven neighborhood in Atlanta. During NNO, neighborhoods throughout the county, state and nation are invited to join forces with police to heighten crime and drug prevention awareness, generate support for local anticrime efforts, strengthen neighborhood spirit and police community partnerships, and send a message to criminals letting them know neighborhoods are organized and fighting back. The event involves over 11,000 communities from all 50 states, U.S. territories, Canadian cities and military bases around the world. Uncle Maddio's is a great resource for catering at office parties, birthday parties, blog parties, and more. And while amazing pizza is our main currency, we also make gourmet salads, hot, toasted paninis, and rockin' desserts (our cannolis are to-die-for!) -- all "Served with Love," the Uncle Maddio's way. Uncle Maddio’s is Great for Kid’s! ATLANTA – January 26, 2011 – Patients, staff and supporters at Children’s Healthcare of Atlanta had their heads in the dough thinking of concoctions for a new and healthy pizza recipe to be featured at Uncle Maddio’s Pizza Joint. Uncle Maddio’s, which has been voted best pizza in Atlanta, developed a unique ordering style that gives customers control to build homemade pizzas. They asked restaurant patrons, patients and staff from Children’s to join in the fun and create their own healthy pizza that would be the new Real Hope Signature Pizza item on Uncle Maddio’s menu. “At Uncle Maddio’s we developed the next generation of pizza joints, so it’s natural that we would partner with an organization that gives next generation care to our children,” said Matt Andrew, Chief Pizzamaker, Uncle Maddio’s Pizza Joint. Six pizza recipe finalists were selected by Uncle Maddio’s staff. On January 22, families flocked to the Toco Hill’s location to pick their favorite. Erin Yount won the crowd over with a unique masterpiece including whole wheat crust, herb pesto sauce, mozzarella cheese, spinach, pepperoni and zucchini strips. Erin has been a regular at Uncle Maddio's because she was sensitive to gluten products and heard about their gluten-free crust pizza. Erin is considering a career in occupational or speech therapy, has spent time shadowing therapists in the Speech and Language Clinic at Children’s. Erin not only gets Uncle Maddio’s top chef bragging rights, but she also receives free pizza from Uncle Maddio’s for one year. The Real Hope Signature Pizza will be available until April 15. Two dollars from every Real Hope Signature Pizza benefits pediatric research at Children's. Patrons of Maddio's can also support pediatric research by donating at the register and on-line. Definitely not your average pizza place, Uncle Maddio’s uses fresh, local ingredients for its homemade pizzas, toasted subs and gourmet salads. And it even boasts specialty offerings such as gluten-free crust and free-range, hormone-free chicken and angus steak. Uncle Maddio’s Real Hope Signature Pizza is available at Uncle Maddio’s Pizza Joint at 3027 North Druid Hills Road Atlanta, GA 30329. Children’s Healthcare of Atlanta, a not-for-profit organization, is committed to enhancing the lives of children through excellence in patient care, research and education. Managing more than half a million patient visits annually at three hospitals and 17 neighborhood locations, Children’s is one of the largest clinical care providers for children in the country. Children’s offers access to more than 30 pediatric specialties and is ranked among the top children’s hospitals by Parents magazine and U.S.News & World Report. With generous philanthropic and volunteer support, Children’s has made an impact in the lives of children in Georgia, the United States and throughout the world. Visit www.choa.org for more information.